Time for another unboxing! 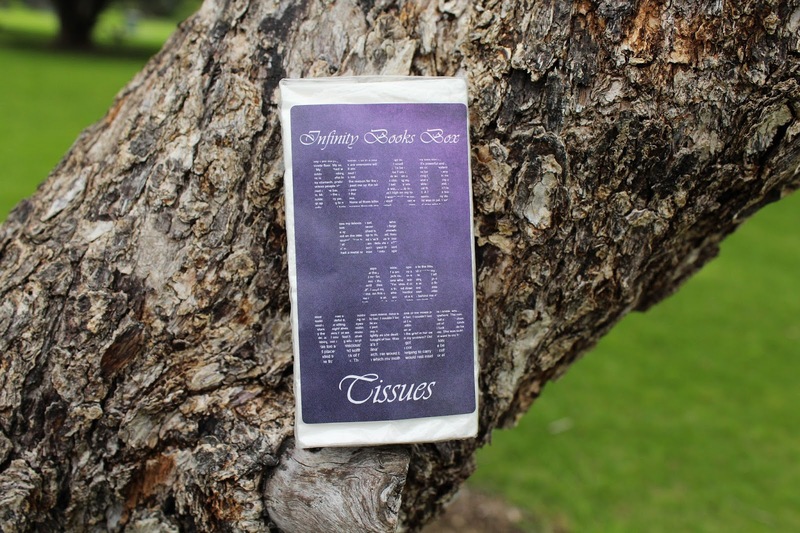 This time I'm reviewing for Infinity Book Box's first ever box with the theme 'Read 'Em and Weep' I was ever so excited to receive this box, especially since it's NZ's first bookish box! 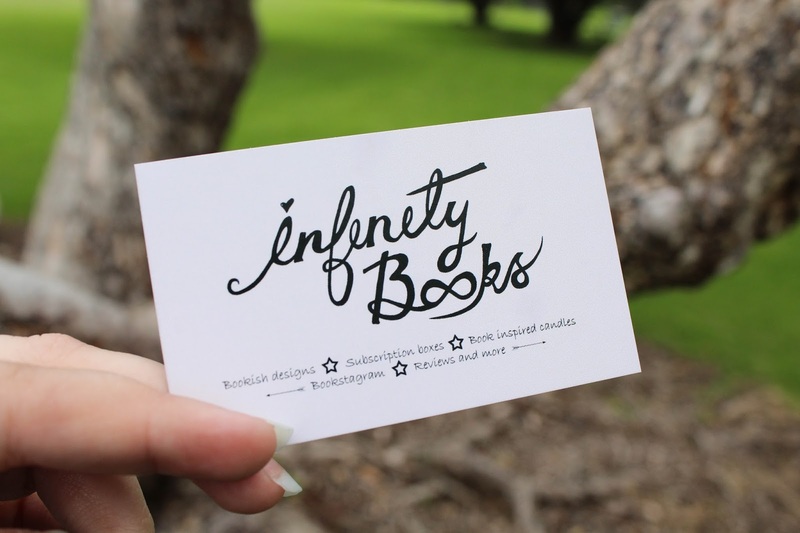 For those of you wondering, Infinity Books Book is a New Zealand based subscription service that's inspired by YA books! It's run by a wonderful designer, Chloe, who actually puts together every item in each box. A box costs $37.99NZD + shipping (remember, that's in NZ dollars, so it may be a lot less in your currency) and is available worldwide. I received this box as a representative, but all thoughts are my own. Infinity Books Box says "The contents [of each box] will be 4-5 book related items. One big item (book, tote bag, pillow case, pencil case, mug etc) and 3-4 little items (bookmarks, candles, button pins, postcards etc). These will feature exclusive designs from yours truly [Chloe], related generally to YA novels but not restricted to YA." PS. I have a coupon code for anyone interested at the bottom of this post! Now, on to the contents of the box! 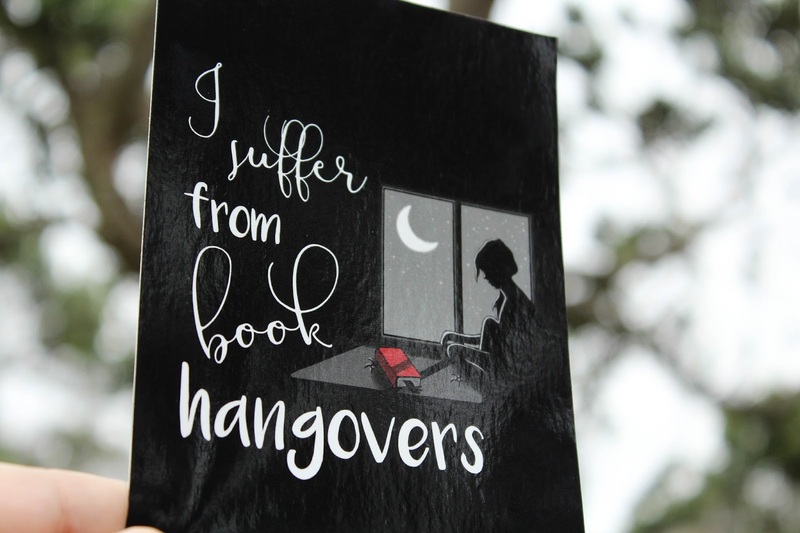 The first item was this bookmark with a quote from John Green's 'The Fault in Our Stars' (that hits the 'Read 'Em and Weep' theme on the head, now doesn't it!) 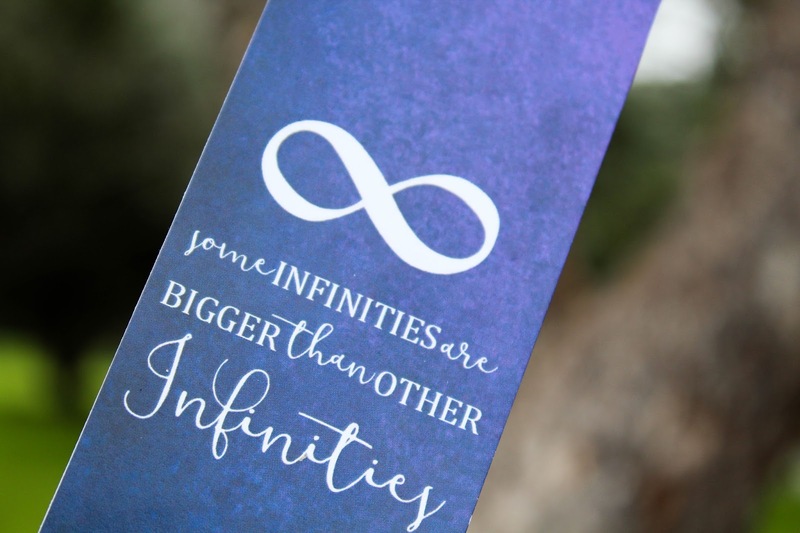 -- "Some infinities are bigger than other infinities." which is one of the most iconic quotes from the novel, and is also reservable with a lovely tree branch design on the back. The bookmark is good card quality and I absolutely love the colours used! The rubber 'Okay? 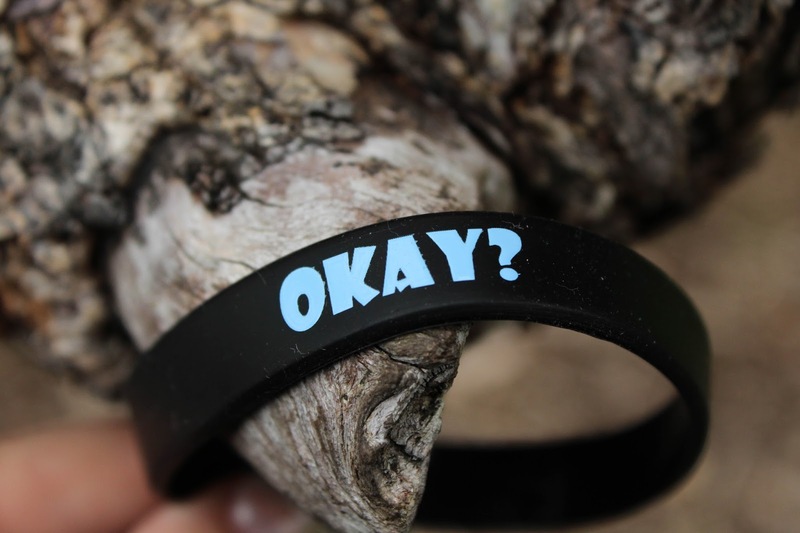 Okay." bracelet was also included, you know, if you ever need to look at your wrist and just sob. 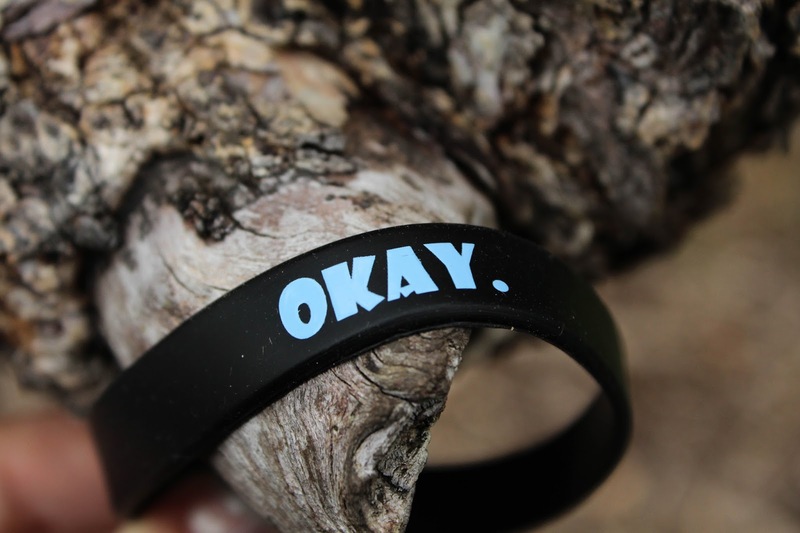 This bracelet is also excellent quality and I'm always thrilled to have The Fault in Our Stars merchandise! These kinds of bracelets are always such a subtle way to show your nerdy side. -- The candle smells amazing, is in the cutest tin, and who doesn't adore a good Harry Potter goodie? I think this is one of the most unique candle ideas I've seen in a while! 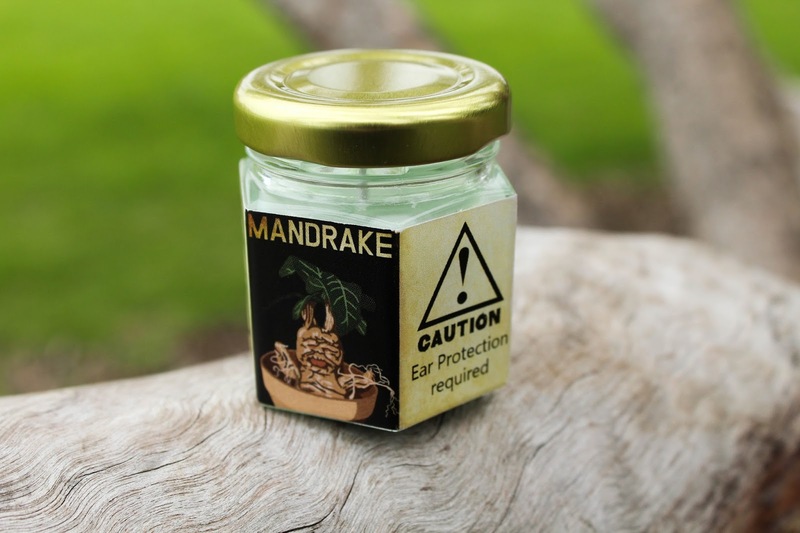 All I can think about is how good this candle will look with my copy of Harry Potter and the Chamber of Secrets (illustrated edition) and how I will probably never burn it because I just need to keep it forever and ever. According to the information card, a second scent, called Moaning Myrtle, was sent out and I'm desperate to know what that looked and smells like! If you have a photograph, be sure to leave it in the comments below! 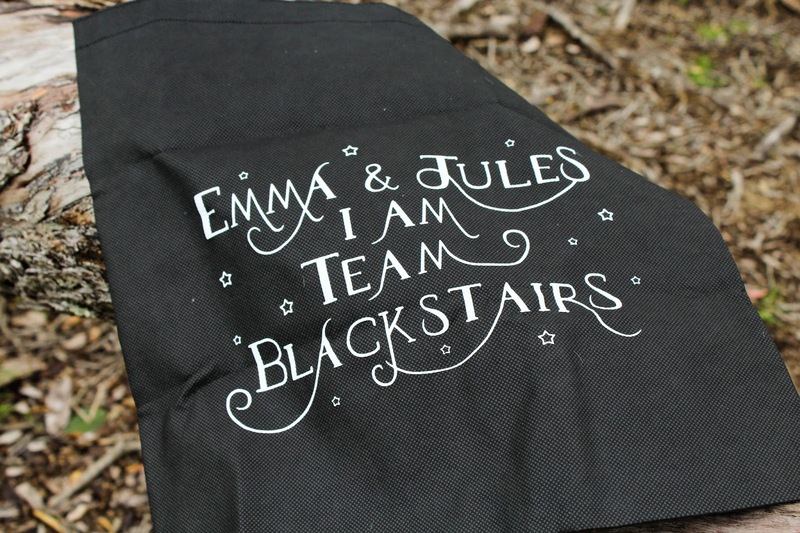 This tote bag, inspired by Cassandra Clare's 'Lady Midnight' which is a book that I haven't read yet, but apparently it caused Chloe (and most of the bookish community) some 'mega feels'. When I did my unboxing on Instagram stories this was the item that everyone went nuts over! The only thing I didn't like about this item was that it was a grocery-ish tote vs a canvas/cotton tote, which I'm not a huge fan of, but I still adore the design! I apologize for the terrible photo, I've never been good at tote bag photos haha! These adorable button badges, inspired by Jojo Moyes' 'Me Before You', were also included in the box, and I have to say, those designs are too adorable! Again, I haven't read this book, mainly because I don't know if I could take a breakdown like I've seen others have just yet but am excited to have these items. Not the best photo I've ever taken, it was quite hard to get the shiny badges photographed in the sun. But the one of the left says 'Me Before You' and the one on the right says "Live boldly, just live" with that darling little bumblebee! 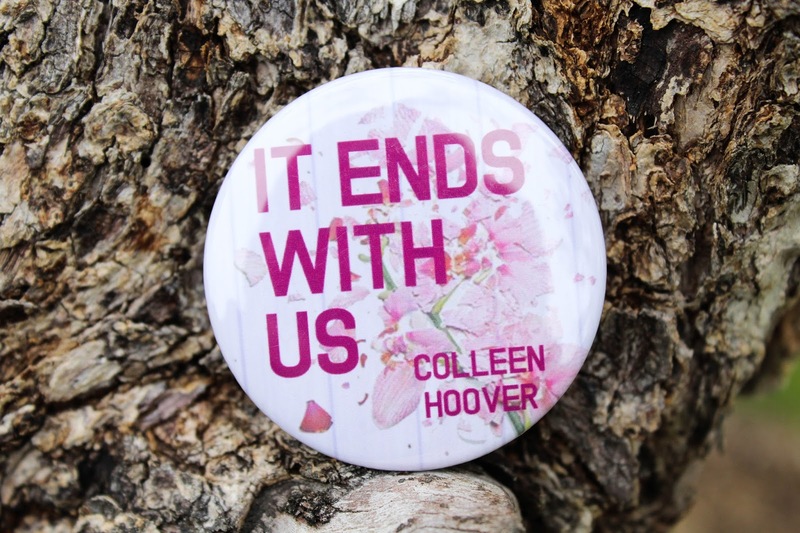 Next was this lovely pocket mirror with the art from Colleen Hoover's 'It Ends With Us' which was one of Chloe's favourite reads of the year! I absolutely love the cover of this book, so bring on any item that shows it! Again, this item was great quality, and who could say no to another pocket mirror? I think I have one in each of my purses now, hehe! Lastly, we had a very comical item... a packet of tissues with the theme written on it which is so funny (and let's be real, insanely true) but I don't think I'll be using them, I will definitely be saving them! The card below is technically the information/spoiler card and isn't counted as one of the seven items within the box, but seriously, this a fantastic art print and I'll be putting it on my wall for SURE! So, in my opinion, this is item number 8! It's the same quality as boxes send out art prints, so why not?! 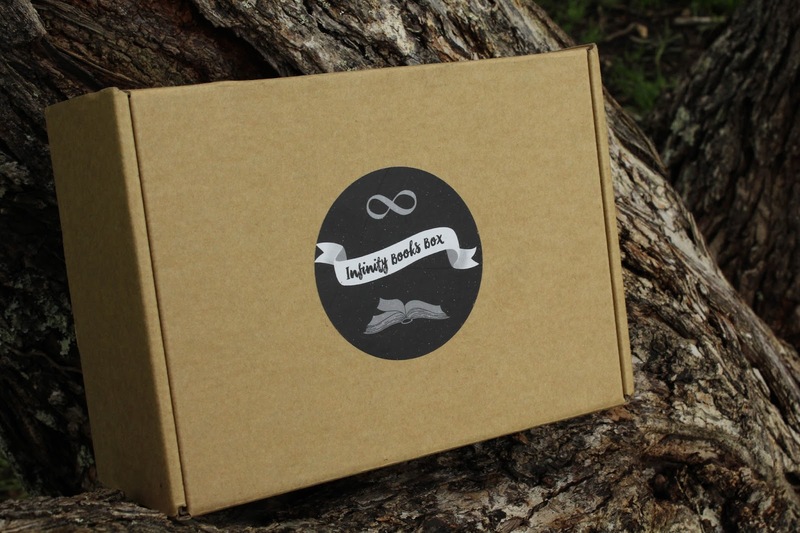 That's it for this first review of Infinity Books Box first box, I really enjoyed it and am always ready to support a fellow Kiwi bringing awesome bookish items to the community! If you're interested, the December box's theme is 'Christmas at Hogwarts' and you can use the code BOOKWORM15 for a discount off your first box! Seriously, I am so freaking excited for the next box, Chloe has already shared a couple of sneak peaks and ahhhh! You won't want to miss out! I hope you enjoyed this review/write-up! I cannot tell you how FREAKING EXCITED I am for the December box (I might even cry a little!!!!!) Will you be signing up?